Liberty Charter's Stephanie Uribe delivers a strike on Wednesday. LEMON GROVE – The Liberty Charter Lions won their San Diego CIF Division V first-round playoff game over the visiting San Ysidro Cougars, 12-2, on Wednesday. Top-seeded Liberty Charter improved to 16-4 on the season and advance to face fourth-seeded Bayfront Charter, which defeated Holtville, 2-0, on Wednesday. 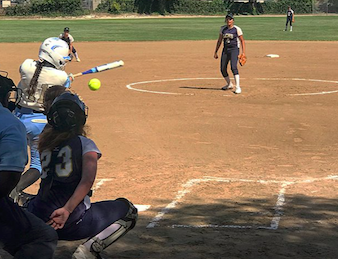 The second-round contest will be played on Saturday at 10 a.m.
Liberty Charter senior captain STEPHANIE URIBE struck out 15 San Ysidro batters with no walks in a complete-game effort. The Lions scored two in the first and four in the second to build a six-run lead. Liberty senior captain BRITTNEY WATSON had an RBI double for the first run of the game. Junior FAITH VIA doubled home two more in the second to give the Lions a 5-0 lead. Liberty added two in the fifth on a two-run home run by freshman KATIE PEET. Peet added an RBI single in the Lions’ four-run sixth. The Lions will face a Bayfront team coach by former Christian High head coach MARY GRABOWSKI. Grabowski is a former East County player of the year with the Christian Patriots. Following a four-year career as the starting catcher for the University of San Diego, Grabowski’s initial venture as a head coach is finishing with a bang. Guiding the Division V program at Bayfront Charter High in Chula Vista, the Sharks clinched the Patriot League championship by nipping second-standing Chula Vista Learning Charter, 8-7, on May 2, finishing 6-0. Grabowski’s ballclub had four of her team’s losses to schools with much greater enrollments – including Coronado, Monte Vista, Mira Mesa, Orange Glen and Sweetwater – to prepare for the CIF playoffs. Liberty Charter, of Lemon Grove, was the top Division V school after the Lions won their first 13 straight games. 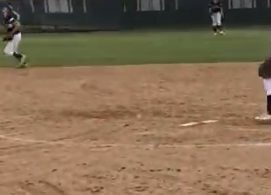 However, Liberty had losses to High Tech High of San Diego, 14-1 and 4-2, as the Storm ended up battling High Tech High of Chula Vista for the Summitt League crown, where both teams finished 5-1.